Tom Mulcair has been campaigning against the Canadian Senate, taking advantage of antipathy to the institution in the wake of Senate scandals. The NDP has long promised to abolish the Canadian Senate so it should come as no surprise that Mulcair is seeking to make abolishing the Senate an election issue. It came as no surprise that this would immediately produce commentary arguing that this promise had "little if any chance of being delivered". 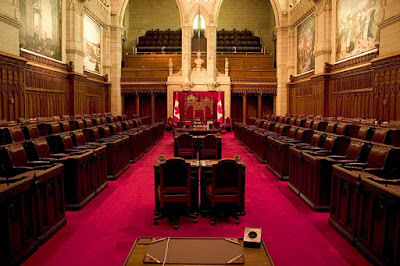 Abolishing the Senate requires the agreement of the House of Commons plus all ten provincial legislatures (the Senate itself cannot block abolition). A comprehensive inquiry posed by Maclean's to provincial premiers revealed just two affirmative responses - from Saskatchewan and Manitoba - on the issue of abolishing the Senate. P.E.I. and Quebec expressed clear opposition to abolition; others were either non-committal or unclear. P.E.I. 's opposition is rooted in the fact that the province is small and has four MPs and a like number of Senators, in absolute terms very few. That appears to be how islanders think about the institution even though their tiny population would actually warrant less representation. Quebec's case is different. The original movement for Triple 'E' derived from hostility to central Canada (including both Ontario and Quebec) as a result of the National Energy Program from the early eighties. Quebec public opinion has generally been hostile to the senate ever since, and more open to proposals to abolish. However, it is likely Quebec governments have been cognizant of Quebec's declining share of national population. As high as 29% as recently as 1966, Quebec's share of population is currently 23.1%, barely greater than its 22.9% share of the Senate. I suspect this accounts for the Quebec government's current position. In the past Quebec has voiced support for having the province be granted the authority to select senators, but never before has it so clearly expressed its opposition to abolition, as witnessed by Premier Couillard's recent statement:"Quebec is and always will be against the abolition of the Senate. It is in Quebec’s interest." If Quebec's share of population once again approached its 1966 share the new circumstances would no doubt reveal Couillard's assertion that Quebec "always will be against abolition" to be untrue. An EKOS poll released on June 19 reported greater support for "serious reform" of the Senate than abolition even among NDP voters. However, the word "reform" is like the words, freedom, equality and democratic: it is a positive buzzword that skews the outcome towards reform and away from abolition. Many surveys do report substantial support for "senate reform", and I suspect there are large numbers of Canadians who would be reluctant to embrace abolition. However, the most recent survey in Quebec by CROP reported 66% favoured abolition when the only alternative presented was the status quo (EKOS found the strongest support for abolition in Quebec). Other surveys posing a similar question in other parts of Canada would be helpful in giving us a complete picture of public opinion. A national referendum could easily pose the question in those terms. The work the Senate has done that has value, particularly various policy studies done by Senate committees, would not begin to justify creating the institution if it did not already exist. As an institution it has more often than not been a useful form of patronage for the governing party for party fund-raising and organizing. I produced a documentary on the Senate in 1985 for CBC's The Journal. [Full disclosure: I should also add that I worked on Senate issues while employed by the Ontario Government.] In preparing the program, I talked on the phone to one former senator, John Nichol, who had resigned from the Senate after seven years. I asked him why he became a senator in the first place. The answer was that it was because he had been elected as president of the Liberal Party of Canada, and the Senate was a good place from which to carry out his political responsibilities. He left shortly after exiting the Liberal Party post, despite being implored by fellow Senators to stay, because his role as a national party organizer was finished and he wanted to spend his time in his home province of British Columbia. Campaigning to abolish the Senate will help Mulcair, not hurt him. If elected to a majority this year, one option he should consider is initiating the process of abolition by passing a constitutional resolution including the requisite amendments. There is no time limit on amendments requiring unanimous provincial consent. Actually taking the initiative could change the dynamic of public opinion in Canada - six of the ten statements from premiers were qualified to one degree or another. Taking the initiative could potentially provoke a viral movement towards abolition. There is a political convention that one amends the constitution by first seeking agreement among the provinces and federal government through negotiations. Most commentary takes this as a premise, as if it were a hard and fast rule about how to approach amendment. Acting unilaterally would permit the NDP to keep its promise and would be an innovation in how to approach constitutional amendment in Canada. Mulcair has nothing to lose by doing so. He should consider it. Even if the effort fails, Mulcair could then claim he kept faith with the NDP's promise on abolition. Given that circumstances could evolve where he woud have no choice but to appoint senators, this could give him the necessary political cover to do what may become inevitable. One real problem he may confront is that the existing Senate could turn out to be hostile to initiatives from a new NDP government in the Commons. Assuming the Senate does not change what can we expect to see? At the moment there are just 49 Conservative Senators, 29 Senate Liberals, 7 Independents, including Mike Duffy, Pam Wallin, and three others formerly in the Tory Senate caucus, and 20 vacancies. Control of the Senate could be guaranteed for the Conservatives for years to come if Harper filled the vacancies before the election, but it is unlikely he would be willing to accept the political cost. The Canadian Prime Minister with the shortest tenure in Canadian history, Charles Tupper, once tried to appoint several senators immediately following defeat in the 1896 election. The Governor-General of the day, Lord Aberdeen, in a rare example of the representative of the crown refusing the advice of a prime minister, turned him down. There is a reasonable constitutional argument to be made that, following an election, the prime minister should first seek the confidence of the House of Commons before such appointments are made. It would not surprise me in the least if a similar scenario presented itself this year. If Stephen Harper appoints new senators after the election before attempting to win a vote of confidence in the House of Commons, the appointments should be challenged, if they are not first refused by the Governor-General.